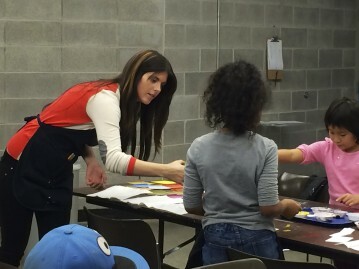 An art education student works on a project with youngsters during one of the Art Workshops for Young People. Student work from Art Workshops for Young People, an offering of the art education dual program in SU’s College of Visual and Performing Arts (VPA) and School of Education, will be exhibited in “The Big Show” on Saturday, Nov. 9, from 10 a.m.-noon in the art education wing of Comstock Art Facility, 1075 Comstock Ave. The semester-long Art Workshops for Young People are taught by undergraduate and graduate art education students. Nine workshops in two different time sessions are offered each semester for children ages 5-15. “The Big Show” is the culminating exhibition. Patrons have the opportunity to view work in a variety of media and meet the student teachers, instructors and program staff.